Android Screencast is a reliable tool that allows you to quickly record the activity on your Android phone, right onto the desktop. The application can take both still snapshots and record videos in various formats, then save them on your computer. Moreover, it allows you to set quality options for the recorded media. 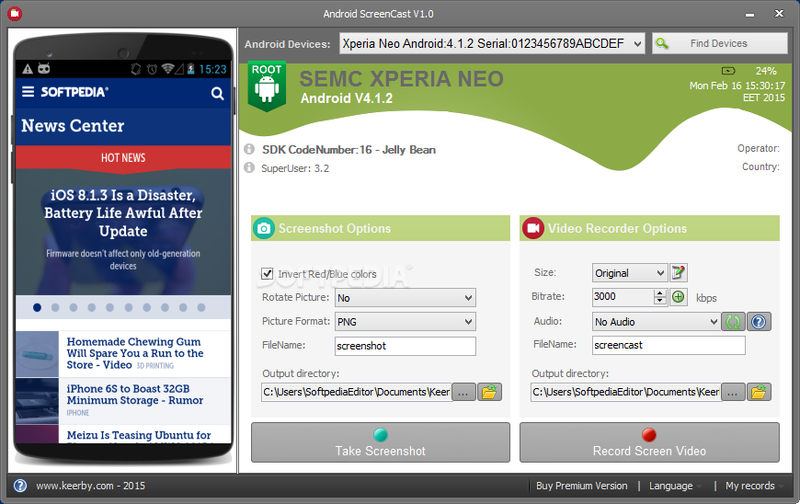 Android Screencast is a simple to use program, designed to facilitate the data transfer between your phone and computer using video recordings. Similar to desktop activity recording software, this application can capture the actions you perform on your Android phone, while it is connected to the PC via USB. The application supports recording videos, in original or custom resolution, as well as capturing snapshots of the current phone screen. Your mobile device needs to be connected to the PC via USB and configured so that it permits the access to its display options. The application taps into the phone’s settings and captures the video feed, without interfering with its functions. Android ScreenCast allows you to modify several options, in order to obtain the desired results. By default, both the pictures and video are saved in their original format, however, you may choose a different size for the video. The pictures can be saved in PNG, JPG or BMP format, in a custom location and with the desired name. Similarly, you can rename the videos and save them in the selected folder. You may modify the bitrate and audio stream, if more are available. Any change is applied with each new snapshot or video. While Android ScreenCast does not require your device to be rooted in order to gain access to its screen feed, it still requires that you enable USB debugging option. This option is valid for Android 4.4 and Lollipop. Moreover, the video recording option is only supported with Android 4.4 or higher.